These are common questions many people ask their Optometrists. The Optometrist may ask if “the flies” move with eye movement, if they are small and dark in colour, or if they look like little squiggly lines. Most times these “flies” in vision are floaters. The back layer of the eye is the retina. The layer in front of that is a jelly-like solution called the vitreous. When this vitreous breaks up over time, it can cause what people see as floaters. Most times, yes. They are usually a normal part of aging and more of an annoyance rather than anything else. When are floaters not normal? Sometimes if they are new, if there are more floaters in the vision, if they are accompanied by flashes of light, pulses of pain or a curtain over or under the vision, if there is a loss of peripheral vision, or a if there is a bubble in the vision. Does anything make them look more apparent? 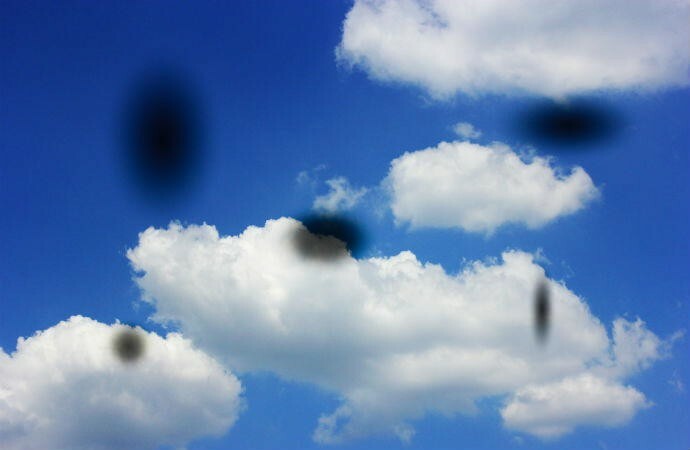 Floaters typically look more apparent when looking at something bright like the sky or a white sheet of paper. How does an Optometrist diagnose floaters? An Optometrist will take a careful history of the size, shape, colour, and frequency that you notice floaters. They may also ask if the floaters move when you move your eyes. An Optometrist will then instill drops in your eyes to dilate your eyes or make the black part (the pupil) bigger so that they can look at the peripheral retina of your eyes. Why are floaters of concern? Floaters can be of concern because if the vitreous (jelly-like solution) pulls on the retina, there is a chance of a retinal hole, tear or detached retina. Unfortunately, floaters do not go away but rather the brain gets used to seeing them and makes it seem like they disappear over time (a neurological phenomenon). Am I at a higher risk of getting floaters? If you have a really near-sighted eye (very high myopic prescription) then your eyeball is stretched out more and there is a higher risk of developing floaters and a possible retinal detachment. Diabetics and people who have had eye surgery (such as cataract surgery) are more likely to develop floaters. Other more serious causes of floaters can include (but are not limited to): injury to the eye, bleeding in the eye, infection and a build up of white blood cells in the eye. Usually there is no treatment for floaters. Eventually your brain gets used to them and they settle below the visual axis and are out of sight. If floaters are excessive, sometimes an Optometrist will refer you to have a vitrectomy (this is a surgery to get rid of the vitreous which is replaced with a salt solution). This is not recommended though as it can increase the risk of getting a cataract and increase the risk of a retinal tear or detached retina. If you are experiencing floaters with flashing light sensations, a loss of peripheral vision, or a curtain/bubble (anything odd in the vision), you should book an appointment with an Optometrist right away to rule out a possible retinal detachment.